As many of you might already know, GameBook originally started as a project of two Finnish golf professionals Kalle Väinölä and Mikko ”Mane” Manerus. They knew – just as well as anyone who has played for a long time – that golf can sometimes be hard. Very hard. Especially when you need to be keeping track of the scores and different wagers while trying to concentrate on your game. Kalle and Mane wanted to bring more fun into the ancient game of golf – still respecting the traditions. They created GameBook to make it easier, faster and more convenient for golfers to keep score. Ever since the beginning the idea of GameBook has also been to make it possible to enjoy the many different game formats golf has to offer. When using GameBook you don’t need to do any math while on the course, just leave it all to the app. Are you familiar with all the game formats GameBook offers? To make it easier for you to challenge your friends on the course, we figured we would give a little reminder and showcase all the game formats GameBook offers at the moment. We’ll start the presentation with the golf classics; Stroke Play, Stableford and Skins. Next time we’ll have a look at the game formats suitable for team play which include Scramble, Better Ball, Irish Rumble and Best Ball. And finally in the third and final part of the series we’ll present the pride and joy of GameBook – our own game formats Erado and Duplicate. Stroke Play – also known as Medal Play – must be the classic of the classics. This is what golf is all about, hitting the ball to the hole with as few shots as possible. In this game format the total number of strokes taken on each hole is counted for the cumulative total score. You can play it in Scratch (gross score) or with Handicaps (net score). In Stableford, points are received for your score in relation to par. This might sound a bit complicated to the golfers who are less well-appointed in the field of mathematics. But it isn’t really. Especially if you have GameBook there to help you out. 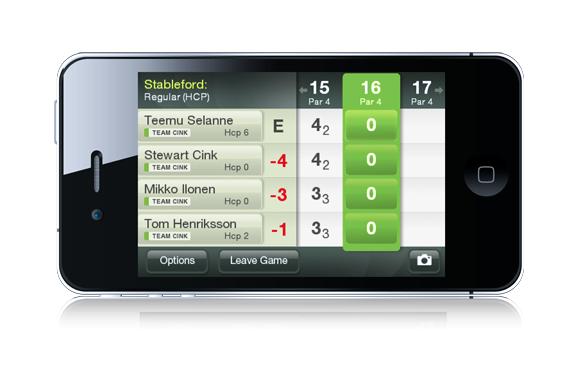 With GameBook you can play Stableford in four different ways – regular or three different modifications. In regular Stableford, you get the following points: eagle 4, birdie 3, par 2, bogey 1, double bogey or worse 0. In modified Stableford, you get the following points: eagle 5, birdie 2, par 0, bogey -1, double bogey or worse -3. In modified 2 an eagle is worth 6 points, birdie 4, par 2, bogey 1 and double bogey or worse 0. And in modified 3 the points are 5 for an eagle, 3 for a birdie, 2 for a par, 1 for a bogey and no points for anything over bogey. Are you in the mood for a friendly wager or bragging rights? In Skins, each hole carries a value that you choose with your opponents (= Skins) and the winner of the hole wins that value. If the hole is tied, the Skin is carried over to the next hole, adding to the pot for that hole. You can play Skins also without the carry-over. GameBook automatically calculates your hole-by-hole Skin standings. This game format keeps golf exiting from the beginning until the very end of each round. Even if you are not doing well overall, you always have a chance on the next hole. Keep in mind that a little competition is to golf what a hint of salt is to your dinner – without it the result is quite tasteless. More on the other game formats coming soon!